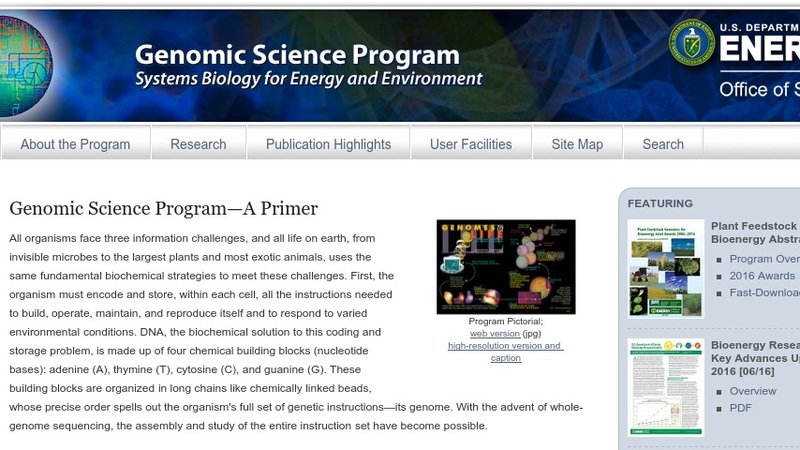 This site provides an overview of the Genomics:GTL (formerly known as Genomes to Life) program, an initiative that focuses on the use of developing technologies to understand and use the capabilities of plants and microbes for U.S. Department of Energy research projects in biofuels, bioenergy, carbon sequestration, and toxic waste cleanup. Site materials include discussions of research projects and missions; an overview of technologies for systems biology; a description of the program's computational environment; and a collection of program presentation materials. The education page features printed materials, suitable for classroom use, on biofuels, microbes, photosynthetic production of hydrogen from water, and other topics. A poster depicting the program's goals and missions is also provided.